People usually come to plastic surgeon Ricardo Rodriguez ’76 to eliminate excess fat — but he will tell you that the lumpy stuff is not all bad. In fact, removing a patient’s fat during liposuction and injecting it back into another area of the body produces rejuvenated, younger-looking skin. The success of these “fat grafts” is due to the restorative stem cells found abundantly in fat tissue. But the real power of these stem cells is not in cosmetic procedures— it’s in their recently discovered ability to treat damaged tissue. “The cells have huge potential to revolutionize medicine,” said Rodriguez, who has been developing techniques to help patients with injuries like severe burns and radiation injury. Ricardo Rodriguez ’76 received a Maryland Stem Cell Research Fund grant to study the fate of adipose stem cells. Rodriguez, who obtained his medical degree from the University of Wisconsin in 1980, has performed both cosmetic and reconstructive surgeries for more than 25 years. While using fat grafts as a “filler” in cosmetic procedures, he was surprised to find that they improved skin appearance. Then, at a 2007 plastic surgery conference, Rodriguez learned that fat grafts could be used to heal tissue damaged by radiation. “That was almost like saying ‘we breathe water,’ it was so nonsensical,” he explained, both because irradiated tissue is severely damaged and because, at the time, fat had a reputation as a very unreliable graft material. It turns out, though, that the stem cells that reside in the small blood vessels of fat (adipose) tissue act as an internal repair system. Over the next several years, Rodriguez spent his time outside the operating room learning all he could about stem cells and irradiated tissue. He developed surgical protocols to inject a concentrated form of fat stem cells into patients, and as president of the International Cellular Medicine Society, he is helping to standardize the processing methods used to isolate the cells in order to ensure patient safety. Unfortunately, bringing this technology into the clinic has lagged, said Rodriguez, because the Food and Drug Administration requires stem cells — even ones removed from and inserted back into a patient within the same procedure — to be regulated like a drug. This has led to a lot of “legal roadblocks,” he explained, that are currently preventing U.S. clinicians from using the technology. Rodriguez has recruited Mary Chirba ’76 (his friend since Colgate, and now a professor at Boston College Law School) to devise legal strategies to deal with the regulatory roadblocks. Until these regulatory issues are resolved, Rodriguez is using his skills to help international patients. 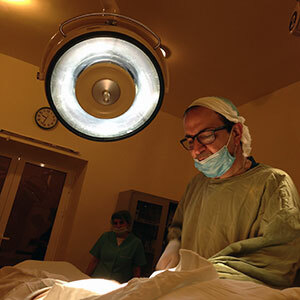 He was invited to teach other surgeons to perform both basic fat grafts and the concentrated stem cell technique on an “incredibly fulfilling” five-day trip to Armenia in 2012, where he operated on 14 patients, the majority of whom were young girls with severe burns. In October, Rodriguez returned for another round of surgeries to help patients and educate more physicians. Along with Jeff Bulte, an MRI imaging researcher at Johns Hopkins, Rodriguez has been awarded a Maryland Stem Cell Research Fund grant to study the fate of adipose stem cells that are injected into radiation-damaged breast tissue. The trial, in which stem cells are labeled with special molecules called fluorocarbons for tracking purposes, will provide information about how the cells behave, where they go, and how safe they are, said Rodriguez.